SCORE: 0-1, min. 10, Ivanuša. 0-2, min. 20, Zver. 0-3, min. 64, Zver. 0-4, min. 88, Prašnikar. It was another hard learned lesson for the Faroe Islands as they slipped to their second defeat to Slovenia in Women's World Cup qualification. Brimming with confidence, Slovenia saw the first half chance of the game less than a minute after the kick off, Špela Kolbl’s ball into the box meant for Mateja Zver cleared by the home defence. Though it did little to push the visitors back and they had a corner a minute later, Lara Prašnikar’s ball in headed wide by Sara Agrež. A slip by Kaja Eržen was fast pounced on by Heidi Sevdal, with 25-yards of space between her and the box, the attacker took off running, opting to shoot as soon as she reached the edge of the box. Her driven effort lacked substance and pinged straight into Zala Meršnik’s midriff, the goalkeeper untested as her team went forward once more. The two lowest ranked teams in group 5, both came into the match knowing that there would be no spot for them in France next summer though that didn’t take any of the spice out of the tie. 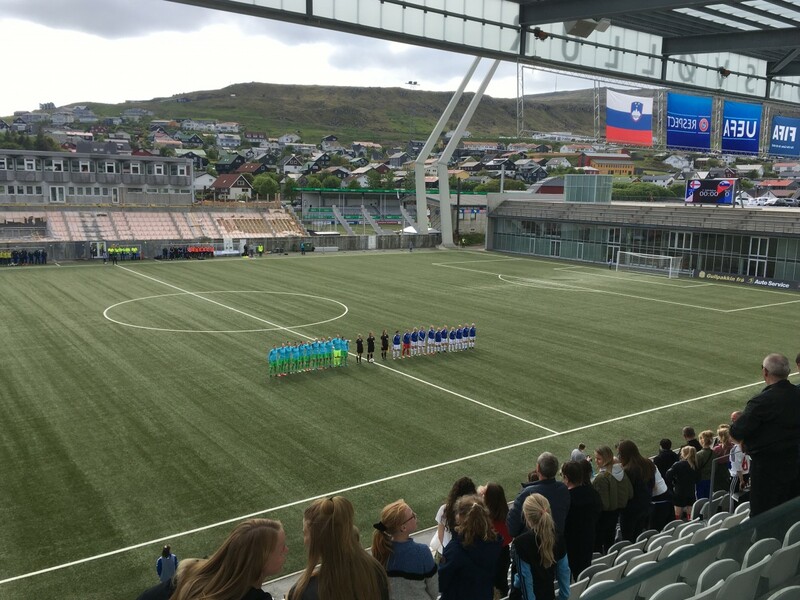 Slovenia keen to prove themselves and quick to show their underline ability, the Faroe Islands not just wanting to impress their home fans but show their own progression over the campaign. With the mounting pressure from Slovenia it wasn’t long before they claimed the first goal, Jóna Nicolajsen drawn out by Kolbl, her ball across missed by Zver as she slipped two yards out. The ball not dealt with as Lara Ivanuša slammed it into the empty net, the goal an early one but wholly deserved. Not letting their heads drop – the team already having conceded 37 goals in five qualifiers – the hosts got forward and won a free kick soon after, the set-piece taken short. From captain, Rannvá Andreasen the ball found Ansy Sevdal, the defender letting fly from 30-yards, her shot stinging Meršnik’s gloves as it flew over the bar. The crowd in full voice by the time Andreasen made her way over to the corner flag to take the resulting corner, her ball in a poor one that failed to beat the first man. Given a second bite of the cherry the veteran miscued her shot and the ball slipped wide of the near post, the visitors back to press after regaining the ball. Enjoying the space afforded her on the right flank, Kolbl broke into the box once again, a clumsy challenge from behind leaving the winger flawed and the referee pointing to the spot. Zver who had already caused as many problems as Kolbl the one to take the resulting penalty, her spot kick clinically sent into the bottom right corner with Nicolajsen sent the wrong way. Resetting well, the hosts found another counter attack, Heidi Sevdal the one leading the charge once more this time up the right. Not letting her marker wrestle the ball off of her and with two white shirts making their way up the pitch to join the cause, the experienced attacker once again went to the spectacular. Her shot, on the turn, from outside the box sent comfortably wide of the target, leaving Meršnik with the easy job of collecting the errant sphere. Having conceded in the tenth and twentieth minutes, the hosts managed to ride out the storm and avoid shipping another in the thirtieth, although Prašnikar wasn’t a million miles from a gol olímpico on the half hour. Struggling but just about keeping their noses above the water as their legs frantically kicked to stay afloat, the hosts cleared the corner only to have to deal with similar five minutes later. Scrappy the best way to describe their defending at corners, Slovenia a constant threat. The fortieth minute came and went without a goal for either side, the hosts making it to the break with just a two goal deficit though it could have been much for their visiting opposition. After starting the second half brighter, the home side were soon pushed back and deprived of the ball, last ditch defending from Katrina Akursmørk and Ansy Sevdal all to deny Slovenia a clear chance. Possibly having been on the end of a stern half-time talk, the Islanders rallied and again found a spark on the counter, Heidi Sevdal carrying the ball forward but only to chance her arm from 20-yards. The ball given too much spin and forced to curl wide of the near post, the fans making themselves known. Slowly but surely, the home side were finding their feet in attack, consistently driven forward by Sevdal, a nippy run from the attacker saw her float in a cross, the first of the game for the Faroes. Unmarked, Olga Hansen rose well to meet the ball, her targeting off as again the ball was sent wide, though the chance was the best they’d seen all game. Warming in attack but going cold in defence, it was soon three to Slovenia, with Zver closing in on her box, Nicolajsen charged off of her line, floating just out of bounds. Though defenders were back to cover the otherwise unoccupied box, the goalkeeper remained out, the Slovenian captain slipping around her with ease as she began to inch backwards. Seeing her chance, Zver took aim, lifting the ball over the ‘keeper and curling it around the two defenders and under the bar. Both sides made changes as the game became stretched and, in a sense, end-to-end. Fresh off of the bench, Milja Simonsen looked to use her fresh legs to get through the visiting defence, a well-timed run saw her slip through with the ball. Holding her marker off, she encouraged Meršnik forward, the goalkeeper leaving enough space for the substitute to shoot, her low shot skipping off of the turf and slipping millimetres wide. As was typical for the home side, when it looked like they were finally building and finding some degree of fluency on the pitch they were hit in front of goal. A steaking solo run from Prašnikar enough for the visitors to claim a fourth, the Turbine woman dashed forward, teasing the ‘keeper out before slipping the ball around and into the bottom corner.